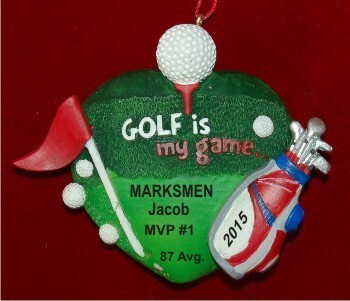 Here’s one of the niftiest personalized golf ornaments in our large collection. The golf is my game personalized ornament features all the important details from tee to green. This is a golf ornament personalized for the recipient, and we’ll add his or her details using a handwritten font that makes it a special and unique memento. Ideal for a member of the golf team, your golfing pals or an accomplished amateur or pro, the golf gear personalized Christmas ornament is affordable and sure to please all the players on your gift list.